For the month of Valentine’s Day, it seems fitting to focus on a bird that incorporates the color red. The red-bellied woodpecker appears to be an apt choice. The bird, especially the male, does feature red feathers. But you have to look hard to find any on its belly! It was not until I held a specimen of a red-bellied woodpecker in my hand that I was able to see that it does have a blush of rosy plumage where a belly button might be. But that’s it – no clearly red feathers where its name implies they are. When I first became acquainted with the species, I wondered why it wasn’t called the zebra-backed woodpecker. I still think that would be a better name, as it’s more descriptively accurate. But red-bellied is the name the bird bears and presumably always will. 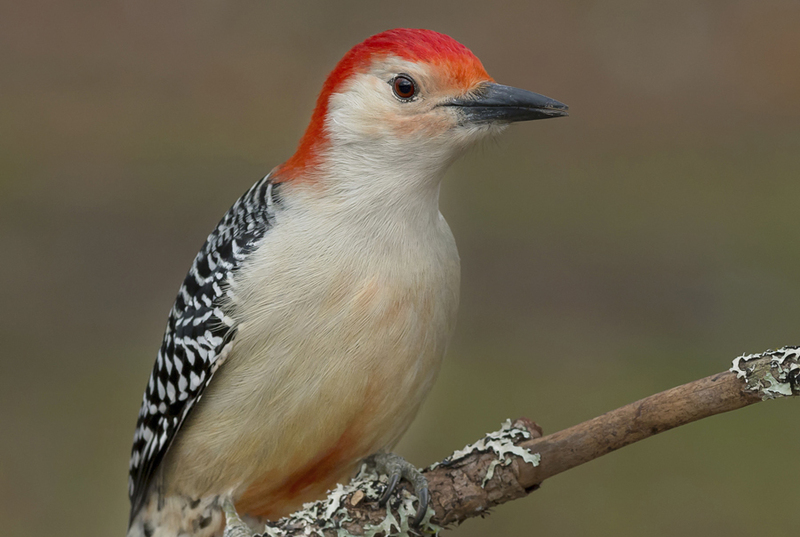 The red on the red-bellied woodpecker occurs on its crown. The male sports bright red feathers all the way from the beak back to the nape, while the female has a few tufts of red feathers just above the beak and then again on the back of her head. It’s very easy to tell them apart, even though they both carry beige underparts and a black and white zebra pattern on their backs. With most of our local woodpeckers, the males tend to have more red on the heads than the females, but otherwise have similarly plumaged bodies. The red-belly is a year-round resident in the Barrington area. 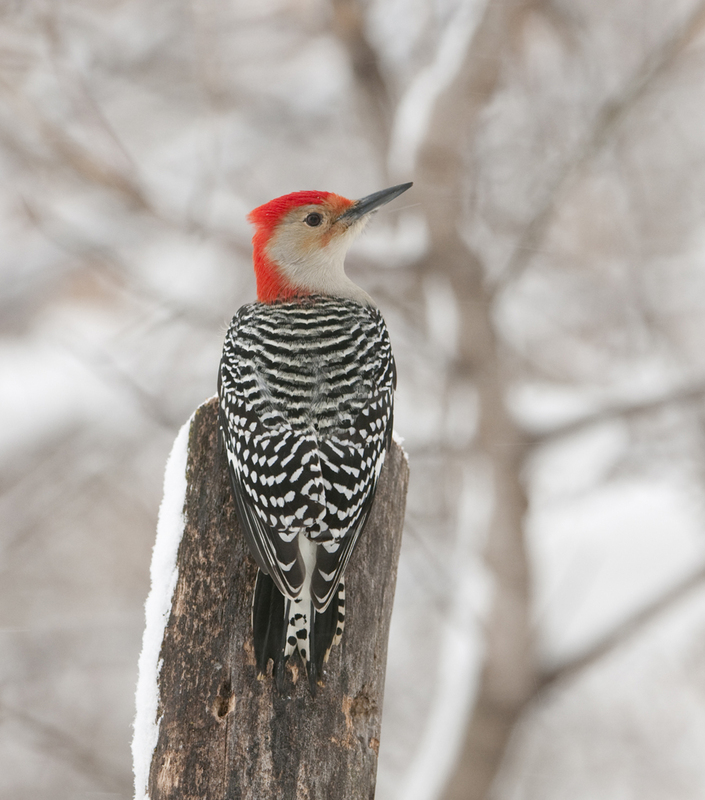 Like other local woodpeckers – downy, hairy, flicker – it nests in tree cavities. Cavity excavation is a joint spring project. The male usually begins and the female finishes. Usually they excavate a fresh nest hole each season but occasionally they will use an old one. Woodchips that fall from their chiseling to the bottom of the hole provide a soft layer for the female to lay and incubate her clutch of 2-6 eggs. The flight of the red-bellied woodpecker is easy to spot. It flies in a pattern characteristic of most woodpeckers: a strong, swooping, up-and-glide,up-and-glide action that immediately tells you that you are watching a woodpecker in flight. Its behavior on the side of a tree trunk is also typical of woodpeckers. It hitches itself up in a jerky fashion, leaning out from the trunk and bracing against it with its stiff tail feathers. This woodpecker is pretty much an omnivore. An interesting fact is that its tongue, with its barbed tip, can reach a full two inches past the end of the beak! While it mainly eat insects and related species pulled from tree crevices, it will readily take nuts, seeds, and fruits. 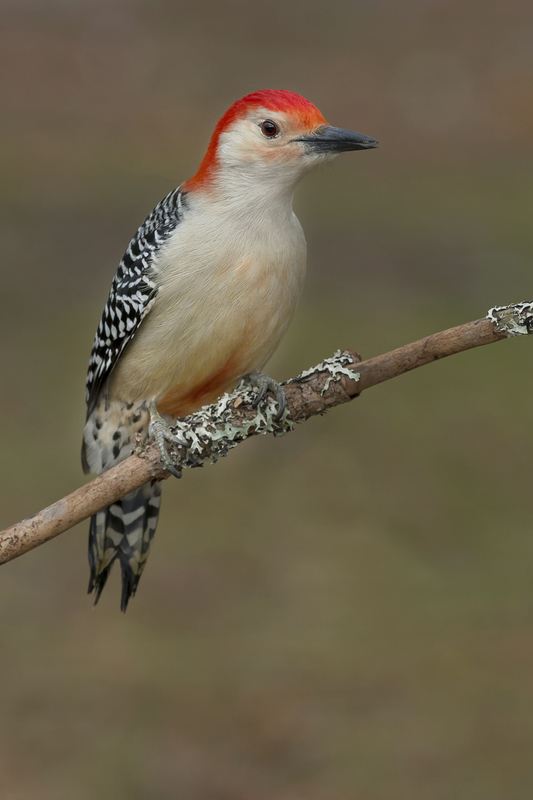 Red-bellied woodpeckers often visit local bird feeders, including ones set out for hummingbirds and Baltimore orioles. They bring a solid, colorful, striking presence to a backyard feeder in winter. Red-bellies favor woodlands and wooded parks throughout our area. You are likely to find them in local preserves such as Citizen for Conservation’s Flint Creek Savanna, Bakers Lake Savanna, and local Cook and Lake County forest preserves. Listen for their strong, repeated calls that strike me as chortles. Then look for this eye-catching, black and white, and SLIGHTLY red-bellied bird hitching its way up an oak or swooping in to land on a tall tree. It’s always a treat to spot and watch a red-bellied woodpecker, even if it doesn’t have much of a red belly.